Today, financial technology (Fintech) is one of the fastest growing sectors in the industry and has revolutionised the world of finance. In the past, investing was “left” to the experts, this was due in part to the lack of visibility around charges, technical jargon and restricted access to financial information. The millennial generation, those born in the last 20 years have adopted technology as their main means of communicating with the world and do not trust the traditional financial institutions. They are constantly searching for financial information using their mobile phone or tablet. These changes are the reasons that the Department of Research at the Instituto de Estudios Bursátiles (IEB) [Institute of Financial Studies] has produced a paper entitled the “Study of the Digital Bank in Spain”. The digital transformation of financial advice will have a significant impact on the delivery of banking and financial services products and services, and redefine the customer experience. Two points of view should be considered. The first aspect concerns habits. The spread of the Internet and mobile phones that support connections to the network have brought about a revolution in who is able to access information, what information can be accessed, and when. Many barriers have come down since this does not involve special applications; instead, a single URL will take us to the area of current interest. Moreover, financial information has far more open-access sources, which has made it possible to expand and disseminate knowledge about finance, together with specific pathways that are much more readily accessible, and include propositions that are tailor-made to the investor’s requirements. In short, it’s no longer necessary to study 4 or 5 years in order to be an investor. What does this imply? That there are more potential clients thanks to the interest aroused in finance. In the current environment of low interest rates, and with a crisis that damaged the image of the traditional bank, clients are seeking advice from alternative sources rather then just their bank, wanting a level of personalisation and efficiency. There is little doubt that Fintech’s digital transformation creates new business opportunities rather then destroying them. 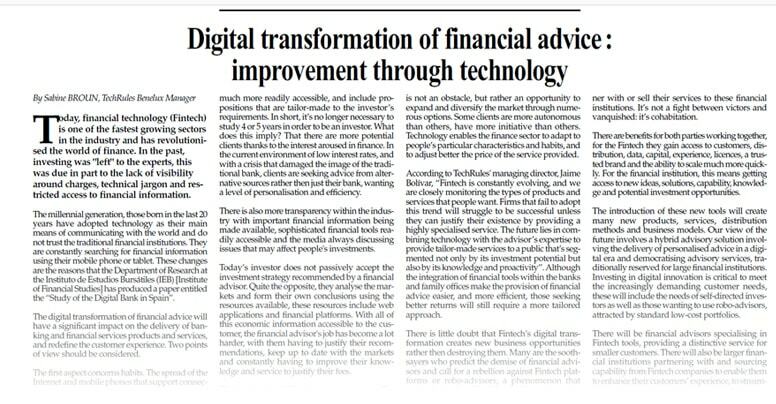 Many are the soothsayers who predict the demise of financial advisors and call for a rebellion against Fintech platforms or robo-advisor phenomenon that recalls the battles of Luddite British workers who destroyed textile-making machines in order not to lose their livelihoods. Precisely. The introduction of such new machinery opened up the way to create many new jobs, spawning new business models. Here we have a similar situation. While some Fintech companies may want to compete directly with the established financial institutions, it is our view that the majority of these companies are more looking to partner with or sell their services to these financial institutions. It’s not a fight between victors and vanquished: it’s cohabitation. The introduction of these new tools will create many new products, services, distribution methods and business models. Our view of the future involves a hybrid advisory solution involving the delivery of personalised advice in a digital era and democratising advisory services, traditionally reserved for large financial institutions. Investing in digital innovation is critical to meet the increasingly demanding customer needs, these will include the needs of self-directed investors as well as those wanting to use robo-advisors, attracted by standard low-cost portfolios. There will be financial advisors specialising in Fintech tools, providing a distinctive service for smaller customers. There will also be larger financial institutions partnering with and sourcing capability from Fintech companies to enable them to enhance their customers’ experience, to streamline their operations and to allow their customers to fulfil their financial needs.